In the border town of Ciudad Juárez, there’s been a small increase in violence over the last few months. For more than 20 years, Alfredo Corchado has lived and worked in Mexico. Through his reporting with the Dallas Morning News, he’s covered border violence. And more recently, Corchardo has used proceeds from his books to go toward a fundraiser for children impacted by border violence. Corchado spoke with Marfa Public Radio about the growing violence in Juárez, about his connection to the city and what he’s hoping the fundraiser can do to help. Note: This interview has been edited for brevity and clarity. Carlos Morales: Alfredo, I want to talk about the violence we’re seeing in Juárez, but first I want to talk about the kids that have been affected by it. Because that’s part of the reason why you’re in West Texas. You’re dropping off copies of your latest book, which proceeds will go towards victims of violence. Alfredo Corchado: This is an idea that I had a few years ago when “Midnight In Mexico” first came out and Tim Johnson at the (Marfa) book company was very generous, very supportive and said look why don’t we use some of the proceeds to help this fund. It’s a fun call SOMOS, it’s part of the El Paso Community Foundation. We’re realizing that you know, it’s I think it’s easier to keep help the students while they’re in Juárez because it’s a lot cheaper and the money can go a lot further. This year we’re hoping to get maybe six students to attend the university. And when you’re in a situation Ciudad Juárez , where there’s so much violence, I mean the generation in today they know nothing but violence. That’s their life. So by helping them with the scholarship, we’re trying to provide a sense of hope and a sense that people on both sides of the border, you know, do care and that we’re in it together. CM: What kind of violence are we seeing in Juárez today. Is it cartel related? AC: “There is internal rivalry in Juárez , which is kind of like a telenovela because you have the brother who was in charge of the plaza, or in charge of the operations there, went to jail. While in jail he named his brother to take over, to succeed him temporarily. But the brother from all accounts, from what I’m hearing does not want to leave. So it’s almost like an internal family feud and that’s causing a lot of killings in the last few weeks. And it’s not just Juárez . But we’re also seeing that in places like Guadalajara, Guerrero obviously, and Tijuana. But I think drug trafficking, the security issue, the violence is something that’s not going to go away anytime soon. CM: Alfredo, you weren’t born in Juárez but you have a strong connection to it. AC: I was actually born in Durango. I think anyone who was born in Durango or Torreon, somehow we are tied to Juárez. Because Juárez was the place where a lot of our our parents or grandparents, that was the jumping point. Juárez kind of represented the Ellis Island of the Southwest. I mean you cross into El Paso, you go through Chihuahuita. So as a kid my father lived in El Paso, worked all over West Texas, Southern New Mexico in the cotton fields. This is during the LBJ years when Lyndon Baines, President Johnson passed the Immigration Nationality Act in 65. That was our opportunity to reunite with my father, who had a Green Card, who was a bracero. So Juárez was always part of us when we lived in Durango. But even when we moved to the United States, every Christmas we headed for El Paso and you see the plaza de los lagartos and you see the star on the mountain and then you cross into Ciudad Juárez — that was always our holiday. So even even if we were far from Juárez it was always in our imagination, it was always in our mind. 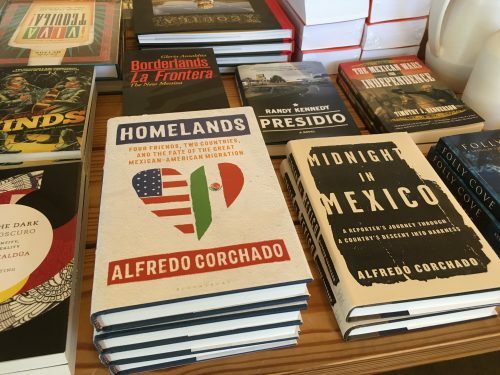 You can find Alfredo Corchado’s latest book “Homelands” at the Marfa Book Company. Proceeds will go towards the SOMOS Fund, which provides support, mentoring and college scholarships for young victims of violence in Ciudad Juárez. This entry was posted in KRTS News and tagged Alfredo Corchado, Homelands, Juarez, SOMOS. Bookmark the permalink.